With just four weeks to go, 24 of the UK’s top professional kickboxers are now heading into the final phase of their training camps as they prepare to do battle on the biggest show of its kind in the East Midlands next month. THE ROAD TO GLORY at Lincolnshire’s Grantham Meres 1,500-seater stadium on Saturday 11 March features professionals from some of the leading gyms across the country. 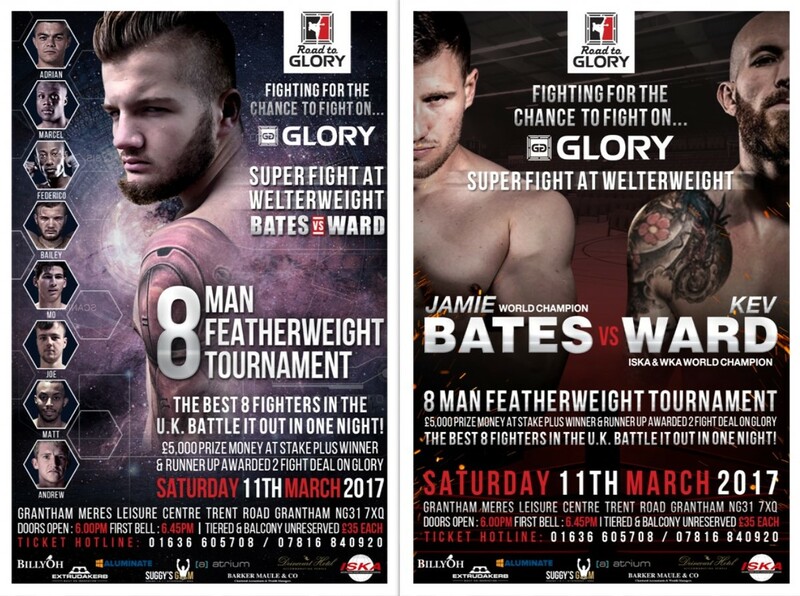 And with £5,000 prize money at stake in an 8 Man FeatherweightTournament, together with the opportunity for three of the fighters on the card to secure deals to appear on GLORY, the world’s leading kickboxing promotion, they will have everything to compete for on the night. Among the stars of the Grantham show will be those taking part in the explosive 8 Man Tournament. Four seeded fighters have been selected by GLORY and everyone will find out later this month who goes up against whom in the quarter finals, when Marcel Adeyemi (The Knowlesy Academy, Edgeware), Mo Abdurahman (Exile Gym, Southampton), Federico Beaka Alfaro (The Knowlesy Academy, Edgeware), Adrian Maxim (Southend Combat Academy), Matthew Gordon (Powers Martial Arts, Sheffield), Andrew Liddell (Contender Gym, Stockton), Bailey Sugden (Suggy’s Gym, Newark) and Joe Himsworth (Renegades Gym, Stevenage) line up to battle it out for places in the semis and the final. Victories in his three bouts on the night will see the ultimate winner walking away with a £2,000 purse, with both fighters in the final being rewarded with two-fight deals to appear on the GLORY stage. The card also features three equally exciting Super Fights with Marcus Powell (London) and Ammari Diedrick (4th Dimension, Nottingham) in a 72kg Catchweight contest; Vinny Church (Backstreet Dojo/Shin Kick, Woking) and William Goldie-Galloway (Pure Impact Muay Thai, Blackpool) in a 70kg Lightweight match up; and Kev Ward (Elite, Southport) and Jamie Bates (Masac Masters, Durham) in an 80kg Catchweight clash. With both Ward and Bates ranked number one in their respective weight divisions and both fighters saying they can make 77kg Welterweight division, this is a match-up between two of the very best in the UK right now and the winner will quite rightly be awarded a two-fight contract with GLORY. “The chance to showcase their skills on the GLORY stage is the ultimate goal for kickboxers the world over,” said Dean Sugden, head coach of Suggy’s Gym and promoter of the Grantham show. “There have been events like this in the USA and more recently in Brazil but this is the first time GLORY has agreed to officially endorse such a show in the UK, so it’s a massive coup for the region and an unmissable opportunity for our home-grown talent. Doors open at 6pm, with the first bell at 6.45pm – all Gold and Silver Ringside seats are sold out but unreserved tiered and balcony tickets, priced £35 each, are available from Suggy’s Gym, 49 Castlegate in Newark or via the ticket hotline 01636 605708 or 07816 840920.